The first time I ever heard about INM was when I found “Northern Lights Top Coat” A holographic top coat with just the right amount of subtle glitter to enhance any color polish or highlight natural nails. That was over 20 years ago!!! INM has cuticle oils, polish, foils, Out The Door Top Coat, Liquid and Powders, gel and much more! Last week, INM put out a Thank you on Instagram. They wanted to tell folks that they were Thankful for them. It was put out in the form of a contest as well. Just re-post and hastag them in it. I first saw if from one of the gals I follow (@kikiandcompany) and she had added that she was thankful for her clients and for all the people she had met on IG and social media! I liked her style and thought about what I was thankful for. Well since my Mom lives in Canada and I live in Las Vegas, I am thankful for the fact that we can Skype each other. And we do! We have “lunch” together every day. We chat just like we were sitting across from each other. It’s awesome! 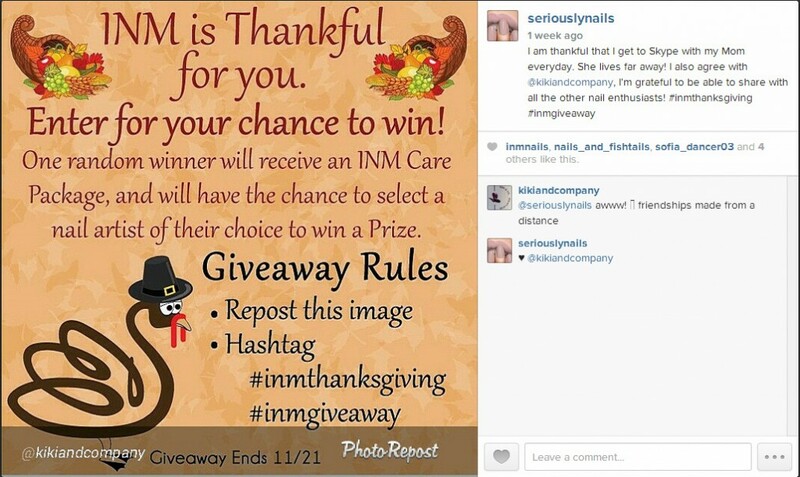 So I re-posted and hastagged with my thanks and last Saturday I got a IG message…..
“A HUGE congratulations” from INM on winning the Giving Thanks package! I did a happy happy hula dance for that! Wow so fun and then I received tons of messages of congratulations from other wonderful nail enthusiasts. I agree with @kikiandcompany. We are lucky to have made such wonderful “friends” on social media. I appreciate every ones talent and love! Part of the prize was that I got to pick a fellow IGer to receive the same prize package. So of course, since I first saw it on @kikiandcompany Instagram account, I said that’s who I would like to receive the same gift! I am EXCITED to see what arrives in the mail! Look at nail world, I have new ammunition!!! 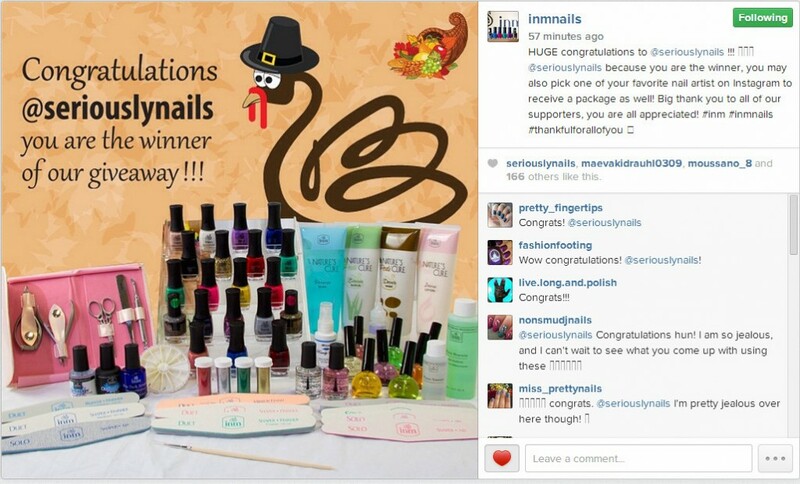 Thank you to INM Nails for sharing the love with both your Thankful Post on IG and for the wonderful gifts! Go check out INM’s products! After over 20 years, I still LOVE Northern Lights! That says something about the company right!